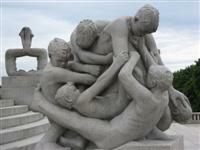 Vigeland Museum and Park is Oslo's most visited attraction, and one of the most popular tourist attractions in Norway. It is a vast green area of duck ponds, trees, and lawns that is a monument to the celebrated Norwegian sculptor Gustav Vigeland. He spent 40 years creating the life-size statues that decorate the walkways and open spaces. There are more than 200 works presenting the human form in a variety of poses and conveying a range of emotions. At the centre of the park is the most impressive piece, the Monolith, a gigantic mass of writhing bodies carved from a single column of stone and believed to be the largest granite sculpture in the world at a height of 46ft (14m). Surrounding the column are groups of human sculptures in various forms of interaction with each other. The most famous and most photographed piece is the Angry Boy, a fat child stamping his foot. There are many more sculptures to be seen in the park and in the nearby Vigeland Museum, featuring a display on the development of the artist's work and his sketches and plaster originals. Visitors should note that although the attraction is commonly called Vigeland Park, the collection of sculptures is technically in a middle section of Frogner Park. Guided tours are available for the museum.